At the recent test drive of the BMW Vision EfficientDynamics Concept, BMWBLOG and BimmerToday had the opportunity to speak at length with Dr. Philip Koehn, Head of BMW Vision EfficientDynamics program. Dr. Koehn’s team is in charge of developing all BMW and MINI concepts, and their introduction in series production, from packaging to functional integration. The conversation went from the VED transmission to four-wheel technology and BMW’s vision of future sports cars. Last but not least, why a three-cylinder diesel engine in a sports car. The answer to all these questions and many others, you can find in the article below. 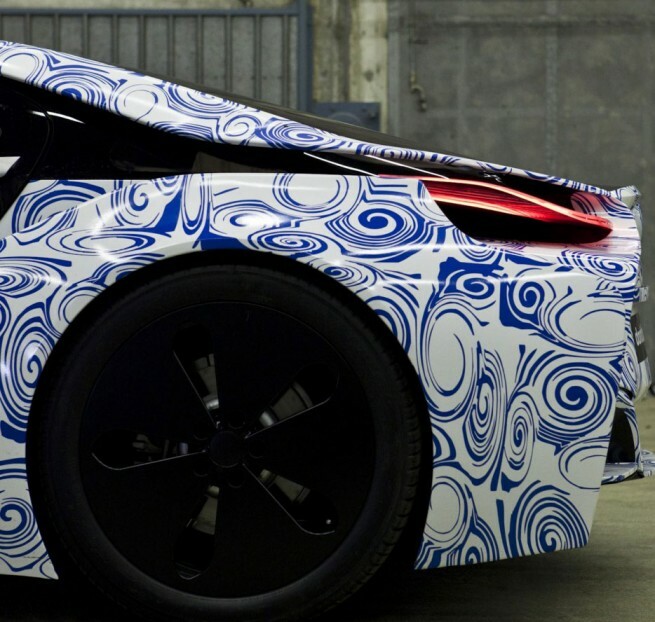 BMWBLOG: How did the idea of a BMW Vision Concept come around? Dr. Philip Koehn: The idea was to figure out what could be done with the new technology that are up and coming, electric mobility for example. The question was: can we still make fascinating cars in terms of functionality and which are fun to drive and handle the CO2 emission strict regulations as also. The team tried to make a vehicle concept that makes use of all advantages we have in the technology field. The finally came up with this idea of combining a small engine which is not really meant to deliver acceleration performs and combining with the electric motors which do acceleration very well. The car became very efficient, the power required to maintain 155 mph is only 120 kilowatts, and we chose the smallest engine we could find in the whole company which would precisely deliver 120 kilowatts. The engine is a prototype and has never been used in a car. I believe it’s called “Engine 1”. So now we said: “we have to build a car for it”. Next challenge: the battery. All these conversions have problems with the battery weight and size, taking a lot of space. Battery should be close to the center of gravity, so we decided to put the battery in the center tunnel. BMWBLOG: Megacity Vehicle and Vision EfficientDynamics. What are the similarities and differences between the two vehicles? Dr. Philip Koehn: Similarities are seen especially at the component level, like the electric drive. As a difference between the two, the electric drive sits at the front axle for VED and at the rear for the Megacity. If we look at this matter even more broadly, there are even more common aspects. So far, we built vehicles with internal combustion engines and I think we have found very reasonable solutions. Now, we look at all-electric vehicles or electric drive units and take a different approach. In a vehicle with a combustion engine, we have always used a large engine and a small gasoline tank, but in a vehicle with an electric drive, we turn the table: small electric engines, but bigger physical storage space for the battery. Compared to the conversions we have done before (eg. MINI E and ActiveE), both the Megacity Vehicle and Vision EfficientDynamics are considered new vehicle designs optimal for electrified propulsion systems. This doesn’t mean the previous designs were wrong, but simply they were the ideal design for internal combustion engines. Now, we write a new book and look at the ideal concept for electric vehicles. One main question is what is the best place to sit the battery underneath. The Megacity Vehicle has a larger battery than the VED, in both vehicles weighing over 100 kilograms. These masses must be accommodated with common sense: between the axles and as deep as possible. There, they are safely protected from accidents. We developed the new vehicle electric concepts around these specifications. Megacity Vehicle has a seating position right on the battery, making sense for a city car. In Vision EfficientDynamics, the battery sits between the driver and front passenger, it is also smaller allowing for a lower seating position, a flat greenhouse and good aerodynamics. Of course, the smaller battery also has less energy stored, but in a sports car, that is not a bad thing in particular. The way a sports car moves makes the electric drive a sensible, limited solution. When high power is needed, an internal combustion engine still makes sense and that’s what we do with the Vision Concept. If you want to go sporty, only use the internal combustion engine and the electric motor can help further. The overall concept is completely different from before, but coherent. BMWBLOG: You have mentioned there will be a sports car. Since the M1, no other real sports car was developed by BMW. Why this change of heart at this time? Dr. Philip Koehn: For the first time in a long time, we are making a classic sports car architecture, but also let’s not discard the M3 for example. We currently have an opportunity to show that driving of the future can still be fun, even with unconventional and environmental feasible drives associated with. The vehicle brings the same longitudinal dynamics as an M3 does now, but on a different level of consumption. We believe that the future sports can be even more exciting, even when electrification of the powertrain happens. BMWBLOG: In sports cars, exhaust sound plays and important role and can boost egos. Can that roaring sound still be achieved with this small diesel engine? Dr. Philip Koehn: The sound of a three-cylinder is more attractive than that of a four-cylinder power unit, because the acoustic of firing the three-cylinders is very close to the six-cylinder engines. In the motorcycle market, it is no longer a secret that the three-cylinder sound can be fascinating. These are indeed gasoline engines, but our three-cylinder diesel engine sounds quite attractive as well. Another example worth pointing out is the one of BMW 6 Series vehicles. The diesel models are perceives as attractive sport vehicles and they had an important share market in the 6er family. Of course, this is a different clientele than the M3 and probably also the Ferrari customer, but I think if the sound fits and adjusts the ride, then the car will be successful. BMWBLOG: Compared with other sports cars, the 328 horsepower number seems relatively low. Is there room for larger engines or the concept will remain with the three-cylinder engine? Dr. Philip Koehn: There is room, of course, but you would then move away from the original idea. The size of the engine is not technically prescribed for this car. We have many exciting challenges ahead of us and later, we will have other things to take into consideration. 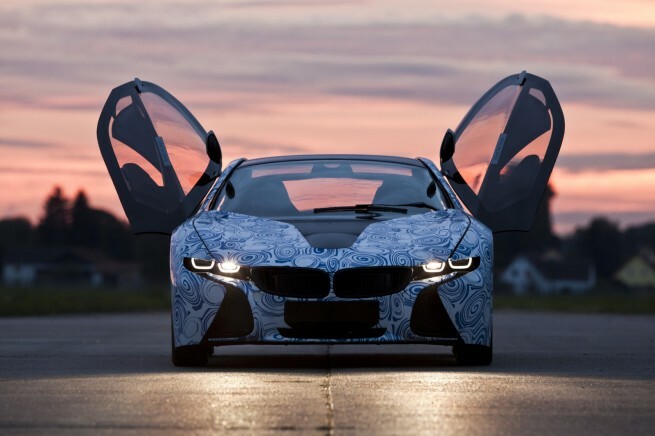 BMWBLOG: Are the figures shown here today a precise preview of the production model coming out in 2014? Dr. Philip Koehn: We have had one year of work with this study concept and therefore little time to show what it is possible. The next three to four years of product development will give us the change to look into more detail at many points. How much does the customer really drive on electric drivetrain? Does he need more or less driving range? So, there will probably be some other changes to the production vehicle. 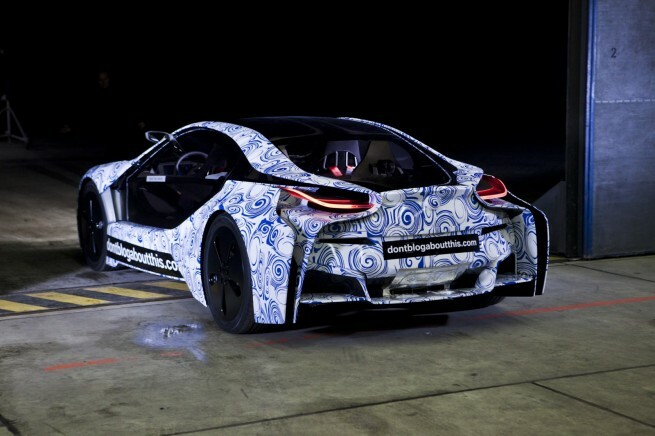 BMWBLOG: Why the combination of electric motor on the front-axle and internal combustion engine at the rear? Dr. Philip Koehn: Technically, the electrically-driven front axle makes sense to me because it brings the all-wheel drive. At the rear axle, I actually need only one generator load the battery. One of the interesting questions we have is if we can go without an electric engine at the rear axle, achieving the same goal, and therefore saving 30 or 40 kilograms. So the last word is yet to be spoken here. BMWBLOG: BMW says that the range of the vehicle is around 700 kilometers and the purely electric range is around 50 kilometers. How large this range should really be? Dr. Philip Koehn: These are some of the exciting questions that we will look at in the upcoming months. In the future, it is possible that big cities will only allow electric driving within city limits. The customer would then use the internal combustion engine only off-city limits. Then, the 50 kilometer driving range might not be useful. How large this range should really be…that’s a point we will explore further. BMWBLOG: Vision Concept is equipped with a four-wheel drive. Is it similar to the xDrive or a completely new concept? Are there details on the power distribution? Dr. Philip Koehn: There is a very significant difference. Today’s all-wheel drive train is a mechanical drive train, there is mechanical coupling between the front and rear axle. In the Vision Concept, this mechanical coupling is no longer possible because we have the battery built into the middle. So there is no mechanical connection front to back, but a purely electrically driven front axle and one with an internal combustion engine, and when appropriate, an electric motor driven rear axle. Very different from how xDrive works. In this case, if I want to accelerate quickly and need maximum traction, we use anyway the power of electric motor and therefore, the front axle. So, we end up in four-wheel mode. BMWBLOG: Braking. How does it work? Dr. Philip Koehn: With the electric motor at the front, we have the ideal conditions for kinetic energy of regenerative braking energy back into power again. This makes the brake system very exciting because we were either with the electric motors to the front brakes on or with the hydraulic brake at the rear axle. We have therefore many possibilities of how to adjust the brake balance, of course, another challenge ahead of us. 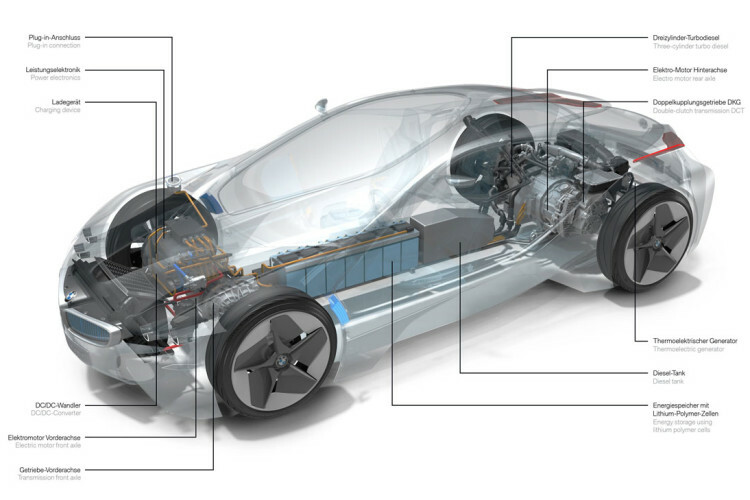 BMWBLOG: What transmission will be used in the production car? Dr. Philip Koehn: A manual transmission will be relatively complex and requires a degree of automation, so in functionality, I see the need of a dual-clutch transmission – very dynamic, fast switching or fast switching back. The torque converter and other automatics are now so technologically advanced that we could conceivably simplify matters in this way without losing sportiness. We will have to decide what is best for the vehicle. BMWBLOG: How will the 195mm, fairly narrow wheels, handle the power and dynamics? Basically, if you look at the tire contact patch, the larger diameter wheels roughly have the same contact patch area as these. Lateral dynamics performance maximum lateral force limits, there won’t be too much of a difference. However, the torque from the front axle is somewhat different. The long tire contact patch will generate a different steering feedback, so this is the point we have to look at. I can imagine that in the production car we might see a slightly wider tire, but certainly not at 285 mm, more like 205-215 mm. BMWBLOG: A curve ball now. We talk about a sports car here with 1,500 kilograms which might not be breathtaking for some of us. Dr. Philip Koehn: The vehicle should not be mistaken for a super sports car. This would mean even less weight and a different drivetrain. The diesel/electric drive is the right direction at the moment and an eight minutes around Nordschleife is probably foreseeable in the future. A super sports car is charming, but we believe that sooner or later, these cars might not be allowed in the London congestion zone for example. The Vision Concept will not go against a Ferrari 458 on a racetrack, it was absolutely not designed for this. We really want to open up a dimension where one is socially accepted and you can enter into zones and areas where in 2013 or 2014 could possibly making difficult to allow conventional super sports cars. BMWBLOG: Major challenges with the Vision Concept. Dr. Philip Koehn: One, to comply with all the worldwide homologations and compliance with all safety regulations especially with the carbon fiber body. Secondly, how do we proper combine functionality of combustion engine, electric motors. How does it work smoothly, powerful? We still need some thinking in this year. 2014 is not far out and we will share more in the future.